Poet and Musician Michael Franti, Journalist Peter Laufer, and P.O.V. examine the cost and repercussions of war. Michael Franti is no stranger to the world of social activism. He has translated his political dissidence into music since the late 80s, beginning with the formation of The Beatnigs, and followed by the more industrial hip-hop of the Disposable Heroes of Hiphoprisy in the early 90s. Today Franti remains steadfast in his role of poet, spoken word artist, front man of the band Spearhead, and most importantly, as a peace and social justice activist. His conscious lyrics have helped raise awareness about AIDS, homelessness, the death penalty, and marijuana decriminalization. It should come as no surprise then that Franti chose the war in Iraq as the topic of his recent political sound off. As one of the initial signers of the Not in our Name organization's statement of conscience against war and repression, Franti joined more than 15,000 people in the fight to regain our country's power from a fraudulent administration and to rebuild America's global identity. 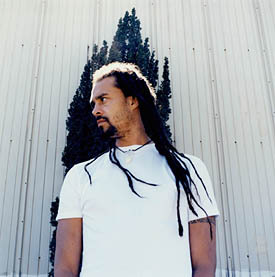 Refusing to be left in despair and inaction following Bush's reelection, Franti continued his fight to challenge the reality of this country's politics. Frustrated with the media, with hearing politicians and officials speak about the economic and political costs of war while the human cost remained largely ignored and unexplored, Franti took to the mic again. Recognizing the good fortune we Americans have to live in a country free to make its own decisions, Franti wanted to examine what life is like living under foreign occupation and military rule. In June of 2004, he traveled to Baghdad and to occupied territories in Gaza, with guitar in hand, a group of friends, and a few video cameras. The result is Franti's eye opening film I Know I'm Not Alone. Franti directed, produced and composed the music for this moving film, which takes us into the lives of real people, after one year of living under the terrors of war and occupation. What we see is a devastating account of the price of war: innocent people and the abominable conditions under which they must live and breathe every day. We see how our nation's officials and troops have become desperate and suspicious in their fear, how we have moved from a force offering freedom to a force of oppression and questionable morality. The film opens as Franti speaks to Maher Al-Wahhash, their taxi driver and tour guide of sorts while in Iraq. “Did they take out any bridges?” Franti asks. This disturbing comment sets the tone for I Know I'm Not Alone. In sharing his music, Franti is able to take us into the homes and lives of Iraqis, to remove the barriers of politics, creating a dialogue that is open and real. As the scenes unravel, locals share their frustrations, wishes, fears and sorrows, and we are able to see what the United States is really bringing to the people of Iraq under the guise of freedom. We see destruction and barbed wire on the streets, houses in shambles, broken glass, trash, and debris. We hear the sound of bombs and explosions, some far off, others close by. We hear the incessant hum of generators, as electricity–when it does come–comes in fits and spurts. We hear the people of a nation left confused and tired, and afraid to walk their own streets at night. Just as nothing is ever black and white, there is a dichotomy these Iraqis experience as a result of our efforts there. They speak of the oppression of Saddam's regime, of living off a salary of one U.S. dollar–per month, of disappearances, of corruption. On the other hand, many seem to think the 'liberation' delivered by U.S. forces isn't a much better trade off. The Iraqis interviewed recall the shift felt when the Marines in Baghdad were replaced by Army troops, when the tone seemed to shift from the “liberation” to the “occupation”. Faiza, of www.afamilyinbaghdad.blogspot.com, asks the questions we as Americans and global citizens must consider. “Iraq is filled with U.S. troops … moving with tanks. What are they doing, just shooting and killing? Are they peacekeeper[s]? How can I believe they are peacekeeper[s]?” As stories of prison abuse and torture, misinformation, and innocent deaths increase, can we truly justify our actions as those done in the role of “peacekeeper”? It can be easy to forget these realities of war here in the U.S., where we have electricity, running water, medicine, jobs, and safety, but I Know I'm Not Alone reminds us. Fighting and bombing is not taking over our land, disrupting our lives and killing our innocent citizens. For many of us, the war exists on TV, in clips from the news, articles on the Internet; not in our backyard. If the stories you hear on the news don't convince you that this war has gone tragically awry, the scenes from the Al-Monsor Children's Hospital will. A fifteen-year-old boy lies in a cast, his legs hit by a cluster bomb. A man's leg must be amputated, as a lack of available antibiotics allowed infection to set in and spread. Another young boy sits up in bed, both of his legs amputated from the knees down. A young girl lies in a cast that almost envelops her small and fragile body. What are we saying to these young people, to the voices of tomorrow, both in Iraq and in our own country? Are we desensitizing them to violence? Teaching them to ignore the needs and pain of others? Are we creating a world where war is part of daily life? Where bombs are heard as often as the songs of birds? What is the human cost of the war–the cost that Franti hoped to shed light on? Are we heading toward what Dr. Galia Golan from Peace Now Israel explains in the film as the “dehumanization” of the enemy?It would seem so, if Peter Laufer's latest book, Mission Rejected: U.S. Soldiers Who Say No to Iraq, bears any truth. A Vietnam War resister and former NBC News correspondent, Laufer has authored many books and won numerous journalism awards. In his latest project, he explores the very same topic Franti addresses–the human cost of the war–but this time on our very own soil. 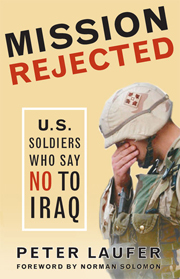 Mission Rejected offers candid, uncensored stories of American soldiers who risked exile and jail sentences in defiance of the war in Iraq. And although Pentagon records show that the number of military deserters has plunged since 9/11, many soldiers are choosing to walk away from what they see as an unjust and immoral war. Mission Rejected begins in part by looking at the current administration's rhetoric regarding the war, and its effect on American's understanding and comprehension of the facts. Of course we can't forget the favorite phrases “weapons of mass destruction” or “the war on terror” so often heard. There are other subtleties in the war language–romanticized words like “resistance” or “freedom fighters” are typically replaced for the tougher, more dangerous “insurgents” or “terrorists”. Laufer's study of semantics raises yet another important question, one that is also spoken by an Iraqi man in I Know I'm Not Alone: is a man who defends his own country from foreign control undoubtedly a terrorist? If Iraqis were to invade the U.S., would those who fought back be called terrorists? Who, exactly, are we fighting? Regardless of the answers to these questions, one thing every soldier in Mission Rejected shares is a story of personal sacrifice, one where morality and a value for all human life is placed above orders or duty. The soldiers speak of the common practice of shooting first and asking questions later, of opening fire under orders without knowing who lies in their range. They talk about how the frustration and pain in seeing your fellow soldiers die easily becomes placed on the “enemy”, rather than the officials behind the war. Laufer, like Franti, brings the stories of the real war in Iraq to light. One soldier, Charlie Anderson, speaks to Laufer about the “dehumanizing process” he witnessed amongst troops while serving in Iraq and its effect on him. When Anderson finally returned to the U.S., he became vocal about his disapproval for the war. Laufer quotes him in his chapter Coming Home: “I'm a veteran of Operation Iraqi Plunder. I think it is important to tell it like it is. I refuse to call it Operation Iraqi Freedom. There was no freedom over there. It was not a war to liberate Iraq. It was a war to make it safe for U.S. business interests. It was a war of aggression and occupation. To call it Operation Iraqi Freedom is an insult to the Iraqi people and it is an insult to humanity” (Laufer 29). Anderson also recounts to Laufer his frustration upon returning home. “Everyone was thanking us for our service and I was feeling ashamed. I was embarrassed. People were saying, 'I'm proud of what you did over there.' And I'm saying, 'God! I'm not. Why are you telling me you're proud of me? You don't even know what I did” (Laufer, 30). More information about Michael Franti's I Know I'm Not Alone can be found at www.iknowimnotalone.com. For further information or to order copies of Peter Laufer's Mission Rejected, go to www.chelseagreen.com or call 800/639-4099. To check out P.O.V. 's American ID installment, go to www.pbs.org/pov/borders and click on American ID.